It’s true - tattoos are painful. It doesn’t matter if you’re a stay-at-home mom or a 6ft 5in 300lb heavyweight boxer, all tattoos hurt! This is where tattoo numbing creams come in. BUT be aware, not all numbing products should be used on tattoos, and some could actually end up ruining your ink! Not to worry though, we’ve searched everywhere to find and review the best numbing creams around, solely for your benefit. In this article, we’re going to explain exactly what numbing products are, how they work, when they should and shouldn't be used, and which are the best numbing creams for tattoos specifically - so you can squirm and squeal in pain just that little bit less while sitting in the artist’s chair. Do Tattoo Numbing Creams Work For Everybody? We've worked extremely hard to research and put together what we believe to be a list of the best tattoo numbing creams currently on the market. If you'd like to know more information about any of the products, click one of the accompanying links and you'll be taken through to a more comprehensive Amazon product page containing more details as well as many more customer reviews. A very popular tattoo numbing gel created by an anesthetic specialist company in California . This numbing gel is named, unsurprisingly, due to its bright and colorful appearance. 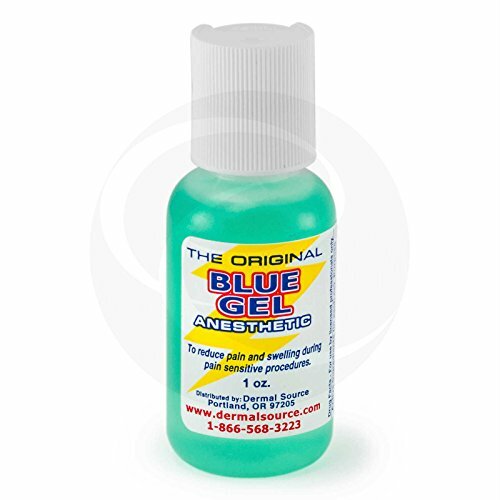 This Lidocaine﻿﻿ Blue Gel contains a mixture of lidocaine (4%) and tetracaine (2%) as well as an active vasoconstrictor added to help reduce bleeding, bruising and swelling, and to help prolong the numbing effect. All of these ingredients combined ensure that the gel has the best chance of creating the desired numbing effect across as many different circumstances as possible. Unlike many other products on this list, due to it's mixture of active ingredients, Lidocaine Blue Gel must be used on broken skin, and will be ineffective if applied before the tattooing actually commences. Therefore, it's best to let the artist work on a small area of your tattoo before proceeding to rub the gel into the skin. However, the advantage in this situation is that the numbing effect begins extremely quickly - between 2-5 minutes! And the effects last on average for about two hours, which is very respectable compared to other numbing products. Using this method of numbing application over standard numbing creams means that there is no messing around at home applying the cream, and then having to wait for the numbing effect to fully kick-in, which can take up to 45 minutes with other numbing creams . This gel's activation time is nearly instantaneous . You must remember to remove excess gel from the area before tattoo recommences otherwise the skin could become slippery, which could give your artist some difficulties while trying to tattoo. Finally, it's not recommended to reapply more Lidocaine Blue Gel in the same tattooing session once the initial application's numbing effect has worn off. This prevents the risk of possible side-effects from applying too much gel. Overall another great numbing product with some really positive customer reviews. The fact that the numbing effect begins straight after application means less waiting around unlike some other creams on the market where activation can take up to an hour. The mixture of active numbing ingredients along with an added vasoconstrictor to prevent excessive bleeding, swelling and bruising makes this a product you should definitely try next time you go in for a tattoo. 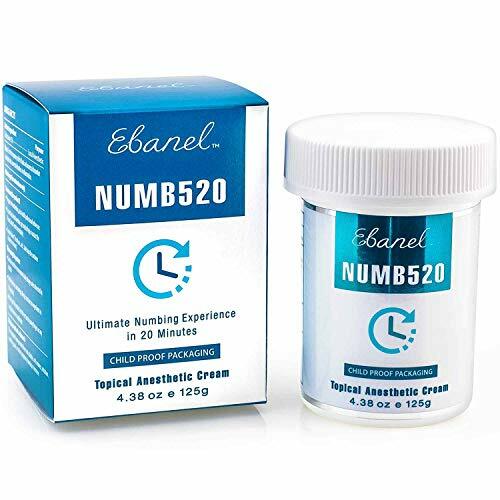 Numb 520 is a hugely popular cream that contains 5% lidocaine for a very strong numbing effect. The product is developed by Ebanel Laboratories in California, an organisation experienced in developing high-standard skin care products as well as being global leaders in fields such as stem cell-conditioned media technology. Once applied, you should start to feel the product begin to work in under 5 minutes, and the maximum numbing effect should be reached within 20-25 minutes, which is extremely quick compared to other creams of the same type. You should feel the maximum numbing effect for a minimum of around an hour, but some customer have experienced numbing for up to double that. A great cream developed by a very professional organisation. You only have to look at the huge amount of positive customer reviews on the link below to see how highly regarded this numbing cream is among tattoo customers. It's a product definitely worth looking into if you want something that you can have true confidence in. HUSH is a FDA-compliant numbing gel specifically designed to be used for use with tattoos, and is probably the single most popular tattoo numbing cream/gel currently on the market. The gel is to be applied in a thick layer around 1 hour before tattooing commences, and once at maximum strength, the numbing effect is claimed to last for up to an unrivalled 4 hours! The gel in non-oily and does not negatively affect the tattooing process or the ink in any way, and aloe, chamomile and green tea have all been added to soothe the skin and cool down it down after tattooing has commenced. Also, the 60 grams supplied in the bottle is more than enough for at least one tattoo, and is probably enough for one or two more as well. If this tattoo numbing gel is so amazing and lasts for so long, then why is it so far down this list I hear you ask! Well, although many hundreds (and probably thousands) of customers are extremely happy with the experience of using this product, there does also appear to be a small amount of users who didn't quite get the desired effect, and the gel either didn't last as long as advised, or the effect wasn't strong enough to block out all pain. However, like already mentioned, the vast majority of users have had great experiences with this product, and would have absolutely no hesitation in buying it again or recommending it to others. While most lidocaine-based products on this list are 5% strength, this one is only 4% lidocaine. This might be why a small selection of customers are claiming that the numbing effect is not quite strong enough for them during their tattooing sessions. Therefore, if you're slightly worried about this gel not being strong enough for you, then it may be worth checking out the stronger 5% tattoo numbing creams in the rest of this list. However, you must remember that this is a numbing gel created specifically for customers looking to get a tattoo, and has hundreds of great reviews backing up its effectiveness. If you're looking for a numbing product to get you through an entire tattooing session, then this gel would be hard to beat due to it's unrivalled numbing duration of up to 4 hours (compared to the 1-2 hours advertised by most other tattoo numbing cream brands). Unlike the rest of the products on page page, this Novocaine product is actually a 5% lidocaine-based spray instead of a gel/cream. Vasocaine Tattoo Numbing Spray is an FDA-approved 5% lidocaine-based product developed by a US-based company called Dermal Source, who have been making high quality cosmetic products for over 12 years. Unlike most other products in this list, Vasocaine spay is applied to broken skin, meaning that it should be sprayed on after a small amount of your tattoo has already been completed. Please note that it will not be at all effective if applied to unbroken skin. Once sprayed, leave the Vasocaine to soak on your skin for about 90 seconds before proceeding to wipe off the excess. After this, the numbing effect will fully kick in after around 5 minutes, meaning that there is hardly any waiting around unlike when using many other lidocaine numbing creams. And the true beauty of this product is that once the numbing effect has started to wear off around the tattoo during your session, just give the area 2-3 more sprays and you're good to go again!​ This makes it the perfect product to use if you've got a long tattoo session booked in. That is not all though. Vasocaine numbing spray also contains an active vascular constrictor. This ensures that bleeding, bruising and swelling is kept to a minimum throughout the tattooing session by restricting blood flow to the area. The feedback left by hundreds of other customers for this product is nothing short of amazing, and you can clearly see why from the write-up above. The 4oz bottle ensures that you will have more than enough spray for a tattoo no-matter how big - and the fact that you can continue to 'top up' the numbing effect throughout your entire tattooing session without any negative effects to the outcome of the tattoo means that it's truly one of the most effective numbing products around on the market today. Greencaine is a professional-grade numbing cream created by US-based pharmaceutical experts at a FDA registered laboratory. This numbing agent contains 4% lidocaine to effectively numb​ most areas of skin with little trouble under most circumstances. The formula also contains no greasy oil-based ingredients, meaning artist equipment won't slip over the skin while tattooing. The cream comes in a generous 4oz tube - more than enough to cover a whole tattoo, big or small, and will probably serve well for another 2-3 medium-sized tattoos after the first application. This cream soaks into the skin with ease after a little light rubbing, and leaves no sticky residue once applied. About 2-3mm of cream should be applied to the skin and the numbing effect should start to work in around 45 minutes. The company are so confident in their product that they actually offer a 100% Refund Policy Guarantee for the first 30 days after purchase. Inactive Ingredients: Aloe barbadensis leaf juice (aloe vera), caprylyl glycol, carbomer, disodium EDTA, glycerin, glyceryl laurate, jojoba oil, SD alcohol 40B, triethanolamine, water. An extremely popular numbing cream for tattoos amongst customers, and it's easy to see why. The short activation time, coupled with a long numbing duration makes this product a definite front runner - and with its non-greasy, non-sticky application, this cream is definitely worth a try. And of course, with a 100% 30 day money back guarantee, you literally have nothing to lose. Topicaine, like most other numbing products in this list, contains the active ingredient of lidocaine in a strong 5% formula, which is perfect to ensure that pain is kept to a minimum in the area in which the tattoo is being applied to. ​Topicaine takes from 30 minutes to an hour to fully activate, and once at full effect, it should maintain a strong numbing effect for between 1-2 hours. An advantage of this cream is that it is non-oily, meaning that tattooing over the cream should be no problem for the artist. It is also petroleum-free, meaning that the cream won't clock your pores. Many ingredients promoting soothing/cooling effects on your skin have also been added to make the tattooing experience as comfortable as possible. These soothing ingredients include: shea butter, aloe, jojoba oil and alpha-bisabolo​. One disadvantage to this numbing cream is the size​ of the tube. At 30 grams, you will be lucky to get more than 1-2 applications out of it - but it will definitely suffice if you're only planning to get just the one piece of ink done. You may wish to go for a larger tube of another lidocaine numbing cream if your tattoo is going to be on the larger side, or if you're planning on having multiple tattoos. If you're planning on getting something smaller/medium-sized though, then this cream will be perfect. Although not specifically a tattoo numbing cream (it's marketed as more of a numbing gel for laser removal) it's still extremely effective at blocking pain and discomfort throughout the tattooing process, and many customers that have gotten tattoos whilst using Topicaine cream have backed this statement up within their reviews (click the link below to see what they say). Finally, the fact that it comes with a 30 day money back guarantee means that it's certainly worth a try. Numbing creams are a type of medicinal product used to numb areas of the skin (or entrances such as the mouth) when applied. Not all numbing creams are created equal however as primary ingredients vary amongst the dozens of products available. These ingredients control the numbing effectiveness, and also dictate how the numbing effect is actually achieved (more on that in the How Do Numbing Creams Work section below). Numbing creams are used in a huge variety of scenarios, from cosmetic procedures such as tattoos and piercings, through to medical, dental and optical procedures. What you must understand however, is that not all types of numbing creams/products can be used for all scenarios interchangeably, and some products should definitely not be used on tattoos. If you would like to use ​a numbing spray or cream to help with your tattoo﻿﻿ pain, then you must ensure that you choose that correct type of cream. This includes making sure that the product contains the correct ingredients, as well as correct strengths/dosages. Luckily for you - all numbing products on this page are completely safe to use either before, during or after your tattooing session (depending on the type of product and accompanying instructions). Different types of numbing agents work in different ways when it comes to how the ingredients affect the pain receptors in your body. There are three mains ways in which numbing agents work. ​The method of nerve blocking is how many types of l﻿﻿ocal anaesthetics work, and also some types of tattoo numbing creams. Nerve-blocking chemicals added to these numbing creams work by reducing the amount of pain signals that the nerves can send to the brain at any one time. Although most of these nerve blocking chemicals do a good job at dampening the pain, they don't usually cancel out the pain completely (as the nerves are still effectively working as normal, it's the pathways between the nerves and the brain that are blocked), and therefore nerve blockers are normally mixed with nerve deadeners (explained below) to maximize the numbing effect. While nerve blockers just stop the nerves from sending pain signals to the brain, nerve deadeners actually temporarily stop the nerves from working, and therefore stopping them from registering any pain at all. The main issue with nerve deadeners when it comes to numbing tattoo pain is that these deadening chemicals don't normally penetrate down far enough into the skin to deaden many of the nerves that are affected by the tattooing needles. These deeper nerves are situated within a layer of deeper skin called the dermis layer. Therefore, as mentioned above, most of the time nerve blockers and deadeners are normally mixed together within the same numbing cream to maximize effectiveness. While vasoconstrictors themselves aren't actual numbing agents, what they do is cause blood vessels to contract, which allows blood flow to slow down. This in-turn causes chemical absorption to slow also. When vasoconstrictors are added to numbing creams that contain various types of numbing agents, the reduced rate of blood flow causes the effects of other numbing agents to last longer, and thus reducing customer pain for longer durations of time. A positive side effect of this reduced blood flow is that the amount of bleeding over the area being tattooed will likely be reduced also. As long as you stick to the recommended doses, the chances of any side effects occurring will generally be low, and any side-effects experienced will probably be very minor​. Side effects normally occur in people who have very sensitive skin, or in people who have any underlying skin conditions at the time of numbing product application. If you believe that your skin may react adversely to the application of any numbing agents, it's always best to speak to a doctor before any attempts to apply a product. Side affects can either occur immediately at the time of application, or at a later time. However, the vast majority of minor side effects generally last for no longer than a day or two. It is extremely important to read the directions and warnings for your chosen numbing product very carefully. Applying too much numbing agent to an area of your skin at any one time can cause potentially serious side effects, so extra take care. If you do experience any side effects and become concerned that it might be more serious than minor skin irritation, it's always best to see a doctor to get it checked out. To some extent yes, but there are a few factors involved that determine just how effective any numbing cream might be. What you must remember is that everybody's skin is made up differently. Different sensitivities, different thicknesses and slightly different nerve structures. Therefore, everybody will feel varying degrees of effect when a type of numbing agent is applied to their skin. The time in which the numbing effect takes to kick in, the time length of time the effects last will also vary from person to person. Not only this, but different brands and types of numbing creams will all have different effects to each other due to the varying strengths and ingredients that they will all contain when compared side-by-side. Lots of people however, are expecting to receive some sort of incredible magic potion when they purchase a tattoo numbing cream. They expect the product to work instantly, last for hours and block out 100% of pain and feeling. In the real world, this is just not going to happen, so it's important that you remain realistic. What I will say though, is that numbing creams are incredibly popular, and are sold in high demand for a reason. For the vast majority of people, they do work very effectively and many customers are highly satisfied with the outcome. As long as you buy one of the reputable and proven numbing products listed above and follow the application instructions provided, then you should feel confident that you'll be ​able to get through your tattooing session with noticeably less pain and suffering when compared to not using any numbing products at all. Ensure that you choose a suitable tattoo numbing product - This should be relatively easy to ensure, as long as you've read the rest of this article and chosen one of our approved tattoo numbing creams from the list above. Wash the area - You will want to ensure that you wash and scrub the area of skin you wish to use the numbing cream on before applying it. This should hopefully remove most of the dirt and oil from the area, thus making the numbing cream more effective, as it will be easier for your skin to fully absorb the cream. Put on a pair of waterproof gloves - a pair of gloves that completely block out water/moisture (such as latex) should ensure that the tattoo numbing cream doesn't seep through the material and cause your hands/fingertips to go tingly and numb. ​Apply the cream - Read the instructions provided with your specific product to find out how much cream you should be applying to the area. Some instructions are quite lacking in their detail, so just do your best to interpret the intent of the instructions. For example, if the instructions state to "apply a thick amount of cream to the area" then just ensure that a generous amount is added. Remove the wrap - Keep the plastic wrap applied to the area for about 30-45 minutes, until you can feel the numbing effect begin to work. Once you can feel it working, the wrap has done its job and can be removed. Go to the studio and get that tattoo! How long does numbing cream work for? After you initially apply the numbing cream, it will start working more-or-less straight away. From that point, the numbing cream should hopefully have a good effect on the applied area of skin over the next 45 minutes to 1.5 hours, although this varies from person to person and can also vary depending on which type/brand of cream that you use, although most should work roughly for the same amount of time if the correct dosage is applied. After this timeframe has lapsed, the numbing effect will start to slowly wear off over the next 10-20 minutes, until the numbing product no longer has any effect. Will my skin stay numb for longer during my tattoo if I leave the cream on for longer before getting to the studio? Leaving the cream on for a longer amount of time before getting your tattoo will have no beneficial effects, and will in-fact only decrease the amount of time in which the numbing cream will help you during your session. What do I need to tell my tattoo artist about using a numbing product? You should let you artist know before you arrive that you intend to apply a type of numbing product before turning up for your tattoo, and you should also let them know the name and brand of the cream so they can ensure that no problems are likely to arise throughout the session while using this specific numbing product. Some artists will only let you use numbing products if you buy the product directly from them beforehand. This is mainly so that the artist will know everything about the product already and can be sure that it won't cause any problems while tattooing you. You must also be aware that a small amount of artists refuse to tattoo customers that've applied a numbing product to their skin beforehand - so it's a good idea to contact your artist first to ensure that they have no problems with you using a numbing cream before/throughout the session. Why don't tattoo artists ever use numbing creams ? 1) Many artists, especially older, more traditional ones see pain while getting a tattoo as an important part of the whole experience. They believe that experiencing pain and discomfort during the tattooing process will make the tattoo feel more meaningful once completed. 2) Because tattoo numbing creams don't work for everybody, some artists feel that for many customers the application of the product might possibly be a pointless exercise, and applying the product could potentially, pointlessly cause some side-effects to the customer, such as tingly skin, redness and swelling, all while the pain wasn't really reduced much anyway. 3) Tattoo numbing creams cost money, which many artists may not wish to pay on top of all of their other equipment costs. More on tattooing costs here. Are there any types of creams that the artists definitely won't like me using? Artists don't really like anything that contains lots of 'glycerin'. Glycerin-based products can make your skin very slippery, and this can make it extremely difficult and problematic for your artist as they try to tattoo you. Many numbing creams and gels however do contain a small amount of glycerin, so if you do end up buying a glycerin-based product, just be sure to remove any excess cream/gel from the surface of your skin once the numbing effect has begun, before tattooing commences. Yes. If you try to rub the cream into the area with just your bare fingertips, your fingertips are obviously going to start going numb, which won't feel very nice. If I apply more than the recommended dosage, will it numb the skin better? This is something you shouldn't even consider doing. Although the numbing effect may feel stronger if you apply more cream; applying an overdose of numbing chemicals to your skin can give you nasty side-effects, and will most-likely cause the pain to feel even worse than normal once the numbing effect has worn off. Always use the correct dosage as displayed on the packaging of your chosen numbing product to minimize the risk of unwelcome side-effects. Can I apply numbing cream to my skin to stop pain after getting the tattoo? This is not recommended, your tattoo will likely be sore and swollen, and any types of creams other than specific tattoo af﻿﻿tercare lotions applied to the area will likely prevent the tattoo from breathing properly as the skin tries to recover, which can cause the tattoo to take longer to heal. Take a look at our tattoo aftercare article for further information on looking after your new tattoo. So there you have it! A definitive list of the best tattoo numbing creams currently available on the market. As mentioned, tattoo numbing creams aren't magic, and results do vary from person-to-person, but for the large majority of people, they work extremely well to block out most of the pain. If you're not very good with handling pain, and are scared of looking like a wimp in the studio, then why not give a numbing cream a try? ​Hopefully it can be the one thing that enables you to push through that tattooing session so that you can get that beautiful piece of ink you've been wanting for so long. If you have any further questions, queries, suggestions or issues regarding the article above, please leave a comment below and we'll get back to you as soon as possible. Please share our article!